UV ink is not new; it has been on the market since the 70s. Moreover, in time, it has only grown in popularity. Both manufacturers and printers have evolved to accommodate the application of UV ink with the best methods. That said, many screen printers are not yet aware of the UV inks, especially the ones who are either completely in garment printing or those who are just starting out. Hence, if you as a screen printer are planning to branch out to a different substrate to expand your prints lineup, UV ink is worth the consideration. Let’s dive deeper! How do UV inks work? UV inks are just the ink that cures under UV light. The inks comprise of solid monomers and oligomers molecules as well as pigment and performance additives. It also contains a substance called photoinitiator which when exposed to UV light, releases free radicals which enables the molecules to bond together and create a solid ink layer. Instead of settling in, the ink sits on top of the substrate, which makes it ideals for printing on smooth surfaces. Today, UV ink has grown to dominate the screen printing market. In fact, it makes up nearly 65% of the ink sales in the industry. Here are some reasons why UV ink is so popular and gaining traction. It facilitates faster production time because UV ink cures nearly instantly when exposed to UV light. It is difficult to over-cure UV inks, unlike the solvent-based inks. UV prints are faster and easier to produce. However, it depends on the number of colours you need to print and the curing unit you have. It is a more environmentally-friendly and work-friendly ink option as it doesn’t emit any toxic fumes or other volatile compounds. With UV inks, print shops are able to achieve extremely fine graphic details as it requires a finer screen mesh. 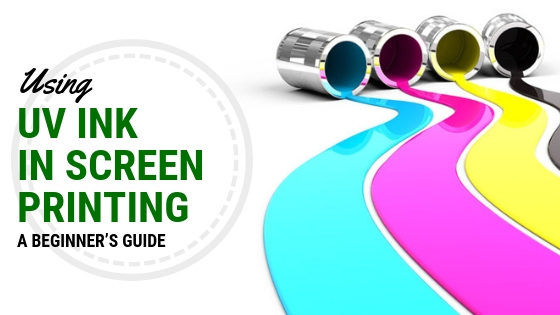 There is a lower waste of UV inks as it doesn’t dry in the screen such as water-based inks. Although it costs more to purchase, it lasts longer than other water-based inks. It demands lower energy usage because of fast cures under UV light. Unlike other water-based ink, it doesn’t require large conveyor dryers. Moreover, new light technologies such as printers are using LED lights to cure UV inks. Printers typically use UV inks to print on smooth surfaces. It is primarily used in screen printing for decals, nameplates, signage, CDs, etc. Its primary use is in industrial application and automotive artwork as well. However, it is worth noting that UV inks sometimes contain additives for screen printing application. There are many speciality UV inks available such as glitter inks which are used in printing as well. For businesses who are into screen printing of only garments could branch out to new markets to provide a larger lineup of products by employing UV ink. Because it offers a wide range of product possibilities which is not possible or otherwise more difficult and expensive with the solvent-based inks. For businesses, opening a UV-ink-based shop provides a range of market opportunity on its own. It is essential to note that the equipment required for UV screen printing is different from the equipment used in water-based screen printing. To make a long story short, it may require an additional initial investment, but the potential is limitless with UV inks.